The Gladiator Pack for Wii is e Equipped with two 16 swords and a shield to protect yourself from attackers, you have all of the bare necessities for a warrior to do battle with. 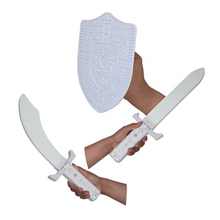 The two swords differ in style to fit the theme of the game being played, to give it a more authentic feel. The blades of the swords are made of lightweight, cushioned foam so that children do not harm themselves or destroy surrounding furniture while hacking away. Located in the handle of each weapon is a slot where the Wii remote fits securely into. Since the weapons are not any heavier than the remote itself, you can enjoy lengthy playing time without tiring from the burden of a weighty weapon. Simply by placing the remote in its allotted slot, you are ready to take on the virtual world.